MSI is the phenotypic reflection of an underlying MMR defect in a tumor. For this analysis, both tumor and normal tissue or cells are required. Typically, paraffin-embedded tissue sections (10 |im thick) are microdissected to obtain relatively pure tumor cells. Areas containing >70% tumor cells are typically used, although regions containing as little as 50% can provide adequate results. Normal cells are derived from adjacent normal mucosa, sections from archival normal surgical specimens for the same patient, if available, or peripheral blood. DNA is extracted separately from the tumor and normal cells. A number of extraction methods are now available that provide good-quality DNA from paraffin-embedded tissue. 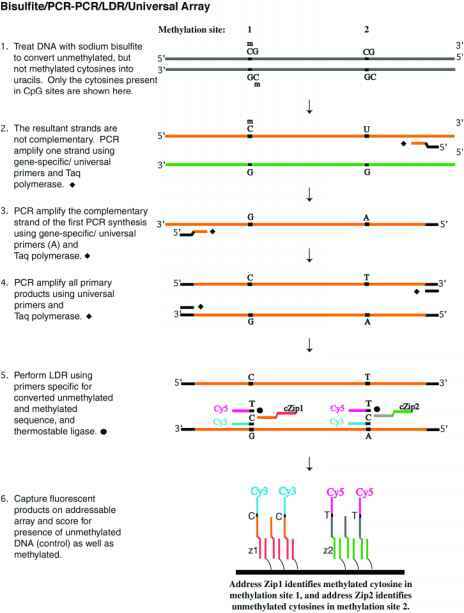 Isolated DNA is analyzed by the polymerase chain reaction (PCR) using radioactive or fluorescent-labeled primers to amplify and visualize multiple segments of DNA containing microsatellite loci. The PCR products are subjected to size-based separation on polyacrylamide gels or, more recently, through capillary electrophoresis. MSI can be observed by comparing the electrophoretic patterns of amplified DNA from both tumor and normal tissue and is scored as the presence of novel fragments in tumor DNA compared to normal DNA (Figure 19-1a). For dinucleotide repeats, these novel fragments can be seen as higher- or lower-molecular-weight fragments (expansion or contraction of repeat). For mononucleotide repeats, however, lower-molecular-weight fragments are typically detected. Allelic imbalance, or LOH, is not scored as MSI since this alteration is the result of an entirely different mechanism (Figure 19-1, panel b). Overall, we have found that the most important aspect of this test is to have a well-optimized PCR assay. Because of PCR artifact, results will be far more difficult to interpret if each of the assays is not sufficiently optimized. Historically, a major obstacle to understanding the tumor phenotype associated with defective MMR was a lack of consensus on the definition of MSI. The number of microsatellite loci and the proportion that demonstrate instability in order to be classified as MSI positive were highly variable between studies. The likelihood that any particular microsatellite will be susceptible to instability in a tumor probably relates to the inherent instability at the locus. Thus, differences in marker susceptibility to instability may lead to differences in the number of tumors scored as MSI positive. In 1998, guidelines proposed for MSI testing at a National Cancer Institute (NCI) workshop were pub lished.19 These guidelines provide a reference panel of five validated microsatellite loci to ensure uniformity of diagnosis between laboratories. Laboratories could use the panel directly or use this panel as a basis of comparison to validate their own set of markers. These loci consist of two mononucleotide (BAT 25 and BAT 26) and three dinu-cleotide (D2S123, D5S346, and D175250) repeat markers. Mononucleotide markers are relatively stable and tend to be monomorphic. Mononucleotide markers were included in the panel because reports indicate that cells with mutant hMSH6 were mainly associated with instability at mononucleotide markers, while cells with mutations in hMLHl, hMSH2, or hPMS2 lead to pronounced instability at both mono- and dinucleotide repeats.48 Thus, analysis of only dinucleotide markers could lead to false-negative MSI results for tumors caused by mutations in hMSH6. 05-Patient1-Tumor.fsa mor.fsa 6 Yel aaJLjjvaA! 100 1 05 110 115 1 20 125 130 135 140 145 150 155 1 6! ABI3100 genetic analyzer. (a) Example of MSI for each of the ten markers. (b) Example of microsatellite changes that can be misinterpreted as MSI: allelic imbalance or LOH. (c) Example of a patient that is heterozygous for the marker BAT 26. The proper differentiation between MSI-H and MSI-L/MSS tumors is important because these two tumor subsets have very different biological characteristics with different molecular etiologies. Current data indicate that the MSI-H phenotype is due almost exclusively to defective MMR. MSI-L and MSS tumors, so far, appear to share the same phenotypic characteristics with little or no involvement of defective MMR. MSI-L tumors show a genetic profile similar to sporadic MSS CRC (with typical KRAS and TP53 mutations and LOH at 5q, 17p, and 18q),but not to MSI-H CRC.53,54 In addition, several histopathologic studies demonstrate that MSI-H tumors reflect the clinical and pathological features typically associated with HNPCC (reviewed above), while MSI-L/MSS tumors are not associated with these features.49 Together, these data indicate that MSI-L/MSS CRC are fundamentally different from MSI-H CRC. This assay, therefore, provides a sensitive test for detecting the presence of an abnormality in the MMR pathway. As noted earlier, MSI is not a specific characteristic of CRC associated with HNPCC. Large prospective studies of unselected CRC patients have determined the frequency of MSI-H in both sporadic and HNPCC-derived tumors. These studies indicated that 12% to 28% of unselected CRC display MSI.16,17 However, mutation analysis of the samples with MSI-H revealed germline MMR gene mutations in only approximately 2% of the patients. MSI also has been described in other sporadic component tumors within the HNPCC spectrum.55 These data led to an interesting paradox: although most CRC derived from individuals with a clinical diagnosis of HNPCC demonstrate MSI-H, only a minority of unselected tumors with MSI-H are from HNPCC families. These data indicate that two groups of phenotypically indistinguishable MSI-H tumors exist: those that are due to an underlying germline mutation in an MMR gene and those that are due to another mechanism. Insight into this paradox was gained, in part, by the analysis of MMR proteins in colorectal tumor specimens by immunohistochemistry (IHC). Nearly all tumors that displayed MSI-H, but without germline MMR gene mutations, demonstrated a loss of hMLH1 protein expression. Subsequent analysis of tumor tissue for hMLHl mutations indicated that somatic mutation was a relatively infrequent event. However, analysis of the methylation status of the hMLHl promoter region indicated that aberrant promoter methylation was the most likely explanation for the loss of hMLH1 expression in these tumors.56,57 Thus, it appears that MMR inactivation can account for nearly all CRC demonstrating the MSI-H phenotype.